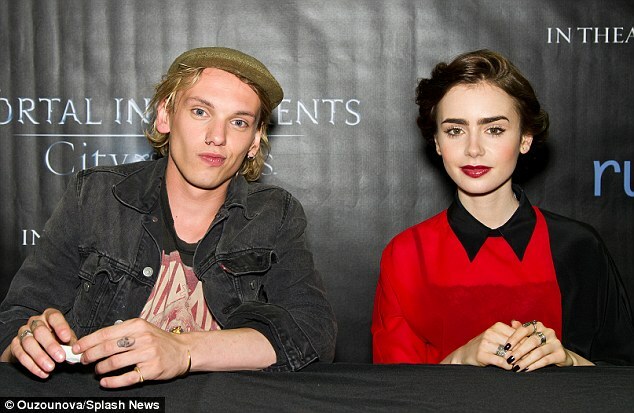 Lily Collins and Jamie Campbell Bower are said to have gone their separate ways - on the romantic front at least. The Mortal Instruments: City Of Bones are in the midst of promoting their new movie - but according to insiders the pair have quietly ended their relationship. Lily and Jamie, both 24, were first linked together in July last year while they were shooting the film. Over the past few weeks they have been on tour plugging the flick, ahead of its August 21 release. Lily, the daughter of British singer Phil Collins, previously dated Twilight star Taylor Lautner, who she starred with in Abduction. Jamie, meanwhile, split from Harry Potter star Bonnie Wright, who he was engaged to, just a month before he was linked to Lily. Jamie met Bonnie while filming the Deathly Hallows: Part 1. Lily Collins looked fresh faced and elegant for her appearance on Good Morning America to promote her new film. Lily's ladylike cream dress with pleated skirt and black lace hem is by Valentino, and she accessorised the look with a pair of patent and mesh pointed stilettos by Jimmy Choo. The contrast of the black lace against the bright cream makes a real impact, and gives this otherwise simple girly day dress a dressy evening feel. The Valentino fashion house was founded by Valentino Garavani in 1959, and is now one of the worlds leading designer brands. This is of course reflected in the dresses eye-watering four-figure price tag. Luckily the high street have picked up on this trend too, and we've compiled and edit of the best for less. In a new interview, Lily revealed she found kissing scenes with Jamie 'super unsexy' while shooting City Of Bones. Lily remained coy when asked about her relationship with Jamie in the interview - and whether they are still together. She added: 'We took that chance and ...Whatever ... It is what it is. People are cast because they have chemistry. 'You're spending 24 hour days together and it's intense. Lily has previously said it was 'inevitable' she would become an actress, rather than following in her famous father's footsteps. She said: 'I started acting when I was two. I think becoming an actress was inevitable as I've always loved dressing up and telling stories, but it was never pushed upon me. MailOnline has contacted Lily and Jamie's representative for comment.